The podcast can be found both on iTunes and Soundcloud. The interview has been recorded as part of the bachelor course ‘Thinking about Capitalism: From Adam Smith to Thomas Piketty’. The essay below does not repeat or summarise the content of the podcast. Rather, it puts the work of Wolfgang Streeck and the podcast in a wider context. Those who are interested can also have a look at the reading list at the bottom of this page. In the 1999 edition of his famous book about the history of economic thought, the American economist Robert Heilbroner lamented the disappearance of ‘capitalism’ as an analytical concept. According to Heilbroner, capitalism is a specific social order and a historic phenomenon, which is characterised by, among other things, profit-seeking capitalists and market exchange. He feared that economists would forget about the tensions and power struggles which are inherent to capitalist societies. Rather than studying these phenomena, economics as a discipline increasingly tried to emulate the natural sciences through mathematical modelling of the ‘economic laws of motion’, Heilbroner pointed out. Economists believed that these models could be used to predict future economic outcomes with certainty. This illusion was shattered by the crisis of 2008, which had not been predicted by the mathematical models that had come to dominate mainstream economics. Ever since, there has been a widespread call for developing alternative ways of studying ‘the economy’. 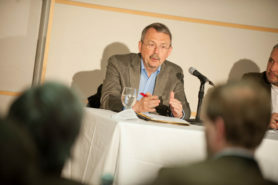 As an economic sociologist, Professor Wolfgang Streeck, has worked on developing distinctive ways of looking at contemporary economic questions throughout his career. In his most recent work, he explicitly rejects talking about ‘the economy’ as a system governed by unchanging ‘laws of motion’ (Streeck 2017: xv). Drawing inspiration from classic thinkers such as Karl Marx, Max Weber and Joseph Schumpeter, Streeck returns to the analysis of ‘capitalism’ as a historically specific social order, characterised by a balance of power between social classes which is subject to conflict and differs across time and space (Streeck 2017: xv-xvi). He has conducted his theoretical work on contemporary capitalism together with Jens Beckert, with whom he co-directed the Max Planck Institute of the Study of Societies up until his retirement in 2014. Beckert examines the role of expectations regarding the future as drivers of social action from a micro-perspective (Beckert 2016), whereas Streeck looks at institutional change within capitalist societies at the macro-level (Streeck 2009). In this way, he has furthered the project of institutional economists such as Robert Heilbroner. Streeck’s work also fits into a broader trend in the scholarly literature, in which the concept of ‘capitalism’ has made a come-back (Kocka and Van der Linden 2016). About ten years ago, Streeck put the defining features of capitalism as a social order at the centre of his work. His earlier writings mainly focused on industrial relations, the welfare state, the European Union and institutionalist theory. Together with Kathleen Thelen, he developed a widely used typology of gradual institutional change in order to explain the slow process of liberalisation that has occured within the ‘advanced political economies’ since the 1970s (Streeck 2009: 123-6). In a book published in 2009, Streeck concluded, however, that this typology of institutional change insufficiently explains the major institutional developments that have taken place within the German political economy since the 1970s (Streeck 2009: 3). The central argument of the book is that the best starting point for understanding these changes are the actor-dispositions which are characteristic for capitalism as a social order. In the first place, capitalists, i.e. the owners of profitable resources, have a disposition to explore ever new opportunities to sell products at a profit. This leads to the expansion of capitalist market relations into ever more areas of social life. Contemporary examples are the commercialisation of household work and the emergence of commercial dating services (Streeck 2010a: 25). Moreover, capitalists have a disposition towards unruly restlessness. They continuously change, re-interpret and circumvent social rules in the pursuit of ever higher profits, for example by evading taxation through creative re-interpretation of tax legislation. This requires them to read social rules in ‘bad faith’: ignoring the original meaning which desiginers attached to a given rule while instrumentally using the rule for their own benefit. In Schumpeterian language, capitalists have a restless drive towards the ‘creative destruction’ of social institutions in order to make ever more profits. In this sense, capitalists are a contituous source of institutional disorder. Even ‘honest’ capitalists who are commited to social obligations cannot escape the pressures of competition. Capitalists who adhere to rules in good faith face the continuous danger that they will be outperformed by their competitors. A few unruly capitalists who break social obligations can force other capitalists to follow suit (Streeck 2009: 240-243). The mechanisms of creative destruction and competition are all at work in the contemporary example of Uber. This commercial internet platform links car drivers to passengers without granting these car drivers the formal status of employee. Thus, Uber conquered a part of the social world which has previously been beyond the reach of capitalist market relations and profit-making, notably the driving services of billions of ordinary car owners. By assigning their car drivers the status of ‘entrepreneur’, instead of employee, Uber circumvents the social obligations (unemployment payments, pension contributions, etc.) which organised labour has extracted from traditional taxi companies. On the one hand, this allows Uber to appropriate staggering profit rates, while, on the other hand, it enables Uber to offer taxi services at prices which are unprecedentedly low. The competition from Uber is an existential threat to the market position of traditional taxi companies. This puts these companies under pressure to also get rid of their social obligations, in order to escape defeat in their commercial struggle for survival with Uber. Unless some governmental authority forces Uber to grant the conventional social rights to their taxi drivers, all taxi drivers run the risk of losing their social rights as a result of the ‘creative destruction’ that is characteristic of capitalism. According to Streeck, capitalists have a resource advantage over the non-capitalist classes when it comes to the articulation and defence of their interests. After all, capitalists are those who own the profitable resources of their societies. By virtue of this resource advantage, capitalists are more likely than the non-capitalist classes to have the power to re-write the ‘social rules of the game’ – i.e. change institutions – according to their interests. In societies with freedom of association, members of the non-capitalist classes are, in principle, able to exert power through collective action. This, however, is a difficult exercise with an uncertain degree of success (Streeck 2010: 17). In Streeck’s view, this feature of capitalism is able to explain significant institutional changes that have taken place right across OECD countries over the last years and decades. It partly explains, for example, why the financial sector has been deregulated globally since the 1980s, and why it has proven difficult to impose new regulation after the crisis of 2008 (Streeck 2017: xxv-xxviii). Based on his detailed case study of Germany, Streeck criticises the ‘varieties of capitalism’ (VoC) literature for being too static and too functionalist. The VoC literature explains different patterns of production, income distrubution and innovation among countries in terms of institutional variations between countries (Hall and Soskice 2001). In their seminal book, Peter Hall and David Soskice conceived of two institutional ‘varieties’ in which countries can be categorised, Liberal Market Economies (LME) and Coordinated Market Economies (CME). Each institutional type is characterised by a relatively stable equilibrium between institutions with complementary functions that allows firms to specialise in specific types of productive activities. Britain and the United States figure as the ideal-typical examples of LMEs, while Germany is portrayed as the quintessential example of the CME model. As opposed to LMEs, Germany is characterised by strong trade unions, employer associations and collective bargaining institutions. Moreover, wages are less dispersed, i.e. income inequality is lower, in Germany than in LMEs such as the USA and the UK. In his book, Streeck points out that the institutional foundations of the ‘German model’ have been crumbling gradually since the 1970s. For example, trade union membership and membership of employer associations declined dramatically, as did the coverage of collective work agreements. In order to maintain their international competitiveness, German firms increasingly avoided collective wage agreements, which resulted in growing wage dispersion (Streeck 2009: 39-44; 244). Each of those trends contradict the characteristics of ‘Coordinated Market Economies’ mentioned above. These trends also contradict the idea of a static ‘German’ variety of capitalism, which is characterised by a functional equilibrium between institutions which contribute to, among other things, low levels of wage inequality. In other words, the static framework of ‘frozen’ varieties of capitalism is not able to explain the dynamic changes that occurred in the German political economy in recent decades (Streeck 2012: 22). Instead, these changes can better be explained by taking as a starting point the characteristics of capitalism as a social order. Wage compression, which is one of the alleged hallmarks of CME-model, gave rise to growing wage dispersion, partly because employers increasingly sought to circumvent the social obligations that come with collective bargaining. This change in the attitude of employers can be explained by the intensifying degree of international competition in recent decades. Rather than mapping varieties of capitalism across space, Streeck prefers to focus on commonalities of capitalism over time (Streeck 2010; Streeck 2012: 21). In his most recent books, he points to social and economic trends which have occurred in all the capitalist democracies of the Western world since the 1970s. All these societies have experienced roughly the same sequence of crises over the course of this period. Crises of inflation in the 1970s were followed by crises of public debt in the 1980s, which, in turn, were succeeded by the private debt crisis of 2008 (Streeck 2011; Streeck 2017: 32-46). In the process, the institutions that restrained capitalist markets during the Trentes Glorieuses after the Second World War gradually faded away: the position of trade unions has been weakened, welfare states have been retrenched, and financial markets have been become deregulated. ‘Thus capitalism returned even though it had never really been gone’, Streeck concludes in the last chapter of his study about Germany (Streeck 2009: 235). His work hinges on the intriguing question why these crises and tendencies occured right across the Western world, and how they relate to each other. These were also the main questions of my conversation with professor Streeck, which is available as a the podcast (see iTunes and Soundcloud). In recent years, Streeck’s work has become increasingly pessimistic. In his latest book, he speculates about the end of capitalism (Streeck 2016). Unlike orthodox marxists, Streeck does not adhere to the view that capitalism will necessarily be replaced by an allegedly better order. Instead, he expects capitalism to enter into a long period of instability and decay. Capitalism will suffer from more and more destabilising tendencies, without anyone having the agency either to repair capitalism’s defects or to replace the system altogether. Among these destabilising trends those that feature most prominently are declining economic growth, rising inequality and growing indebtedness, which seem to re-inforce each other in an unfortunate way. For example, the growing inequality, which results from stagnating household incomes, hinders further economic growth, since it impedes aggregate demand. In addition, households seem to compensate for their stagnating real incomes and the decline of the welfare state by taking-up more and more debt, a development which is a potential threat to the stability of the financial system, as the crisis of 2008 demonstrated. Authors such as Martin Wolf, columnist for the Financial Times, have criticised Streeck for being too pessimistic. They expect that the rising levels of inequality, the problems of the financial sector and the ensuing social and political conflicts can be managed and remedied with the right set of policies. Indeed, the Keynesian post-war decades demonstrate that it is possible to save capitalism from its own contradictions and imbalances, for example by means of counter-cyclical and redistributive government policies. It must be noted, however, that the adversaries of capitalism, such as socialist parties and trade unions, were on the rise during this period. These organisations for collective action were essential ingredients for the post-war decades of equality and stability (Streeck 2016: 21-22). Today such forces do not seem to be available. Instead, the public discourse is dominated by identity politics and the provocative words and actions of politicians, such as Donald Trump. In the meantime, urgent issues about the future of capitalism remain unaddressed. Anyone who wants to take up these challenges, should take notice of the writings of Streeck, in which he nails down significant trends and developments which are likely to shape capitalism’s uncertain future. Streeck, Wolfgang, Re-Forming Capitalism. Institutional Change in the German Political Economy (Oxford 2009). Streeck, Wolfgang, Buying Time. The Crisis of Democratic Capitalism (London 2014). Streeck, Wolfgang, How Will Capitalism End? Essays on a Failing System (London 2016). Streeck, Wolfgang, ‘How to Study Contemporary Capitalism?’, European Journal of Sociology 53 (2012) 1, 1-28. Streeck, Wolfgang, Taking Capitalism Seriously: Toward an Institutionalist Approach to Contemporary Political Economy (Cologne 2010). Streeck, Wolfgang, ‘The Crises of Democratic Capitalism’, New Left Review 2 (2011) 71, 5-29. Streeck, Wolfgang, ‘How Will Capitalism End?’, New Left Review 2 (2014) 87, 35-64. Beckert, Jens, and Wolfgang Streeck, Economic Sociology and Political Economy. A Programmatic Perspective (Cologne 2008). Beckert, Jens, Imagined Futures. Fictional Expectations and Capitalist Dynamics (Cambridge, Massachusetts 2016). Hall, Peter A., and David Soskice (eds. ), Varieties of Capitalism. The Institutional Foundations of Comparative Advantage (Oxford 2001). Heilbroner, Robert, ‘The End of the Worldly Philosophy?’, in: Robert Heilbroner, The Worldly Philosophers. The Lives, Times and Ideas of the Great Economic Thinkers (New York 1953, 1999), 311-321. Kocka, Jürgen, and Marcel van der Linden (eds. ), Capitalism. The Reemergence of a Historical Concept (London/New York 2016). Streeck, Wolfgang, Taking Capitalism Seriously: Toward an Institutionalist Approach to Contemporary Political Economy (Cologne 2010a). Streeck, Wolfgang, E Pluribus Unum? Varieties and Commonalities of Capitalism (Cologne 2010b). Streeck, Wolfgang, Buying Time. The Crisis of Democratic Capitalism. Second Edition (London 2017).